Today we drive to Alleppey, Alappuzha, also known as Alleppey, is a town in Kerala. A town with picturesque canals, backwaters & lagoons, it was described as the Venice of the East. It has a wonderful past, it owes its existence to the sagacious Diwan Raja Kesavadas in the second half of 18th century.On arrival we board the houseboat, locally called Kettuvallam, cruise around backwaters of Alleppey to Kumarakom to observe & experience the daily life of the villagers along the backwaters. Morning after breakfast we disembark the houseboat in Kumarakom. Later we visit Kumarakom Bird sanctuary. There are two seasons for birds: between October & February there are cormorants, teals, & other ducks & from February to July there are darters (snake birds), night herons, egrets, & Siberian storks. It also has golden backed woodpecker, crow pheasant, white-breasted water hen, tree pie etc. Kumarkom Beach.Today we drive to Periyar (Thekkady), one of India’s most fascinating natural wildlife sanctuaries, where one can watch Periyar wildlife at close range.Later we explore the sanctuary to experience the beauty & ecological pattern. Early morning before breakfast leave for a wildlife viewing to the sanctuary on Lake Periyar by boat cruise. After two hours of wildlife viewing get back to the hotel for breakfast. Later we drive to Kovalam, South of Trivandrum. 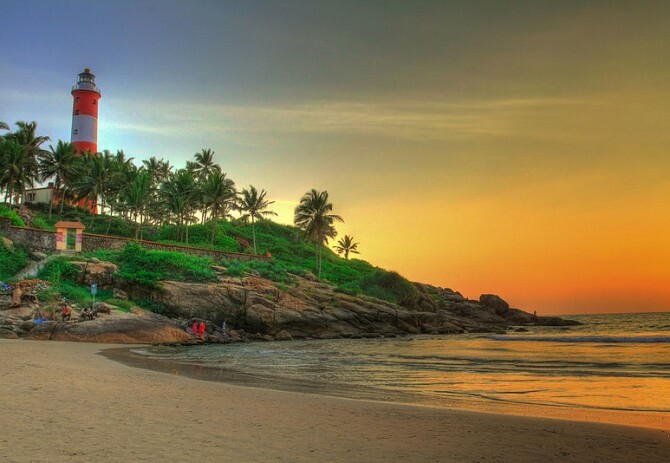 There are two main beaches at Kovalam, separated by a high cliff. It is finding a new significance in the light of several Ayurvedic salons, & recuperation & regeneration resorts which provide a slew of Ayurvedic. If you have not decided yet or wants to customize tour itinerary or hotels listed above in "Enchanting Kerala – God’s Own Country Package from incredibleindia-tourism.org", then we can change the travel itinerary and make a personalized, tailor-made holiday package, especially for you. We can modify this travel package as per your itinerary, budget, duration and the tourist places you would like to visit, including transportation and airfare should be included or not. Please fill the form below to contact us.